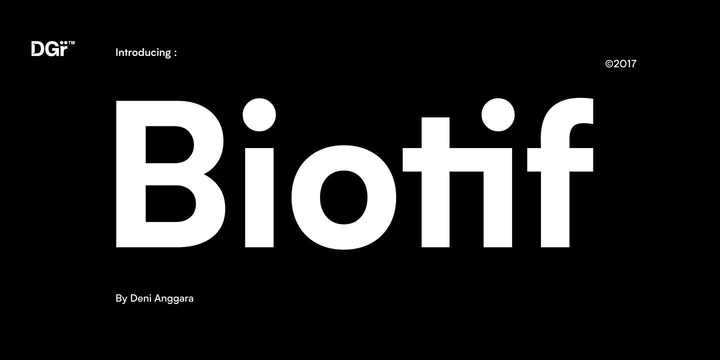 Biotif is a contemporary typeface created by Deni Anggara and published by Degarism Studio which is available in 16 styles, 8 weights (from Light to Black) and their italics, useful OpenType feactures and multilingual support. This modern grotesque sans serif font, it merge well in small sizes for screens. Also is perfect for graphic design, logo, magazine, invitations etc. Have fun! Price: starting from $45,00 for one font to only $180,00 for all 16 fonts. A font description published on Friday, May 5th, 2017 in Degarism Studio, Deni Anggara, Fonts by Alexandra that has 5,255 views.